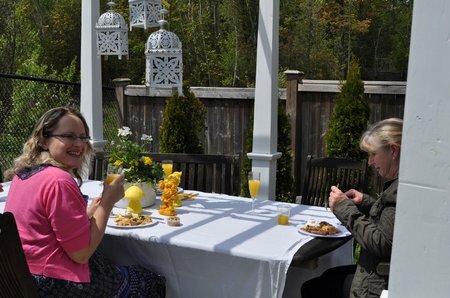 This year for Mother’s Day I decided to put together a little brunch, and invite my Mom and my BFF. We had a lovely time, and my husband did most of the cooking so I could enjoy it too. 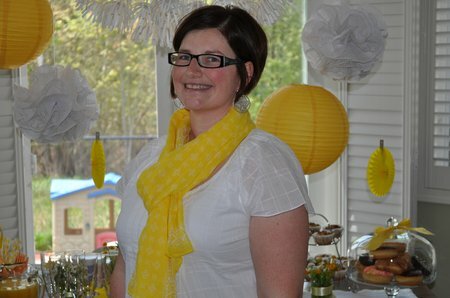 I was inspired by the beautiful spring weather to use yellow as the colour scheme for the party. I don’t own a lot of yellow, but since I used yellow with white, I didn’t really need too much. A few strategic hits of yellow had a big impact. 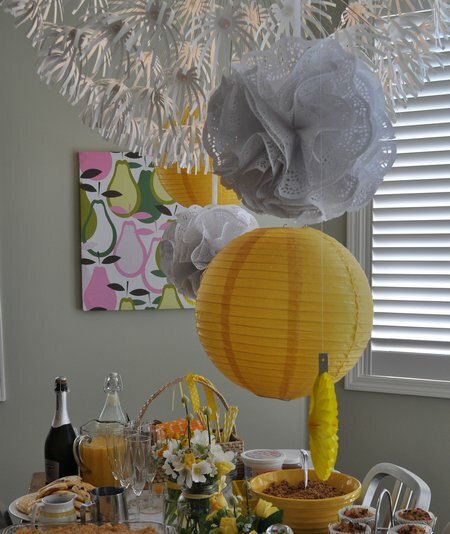 I started out wanting to do a grouping of pom poms and paper lanterns over my kitchen table, that incorporated my fun light. 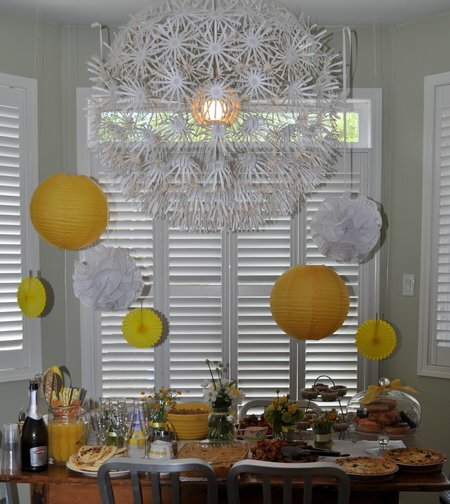 I made paper doily pom poms, and used some yellow paper lanterns for big impact. 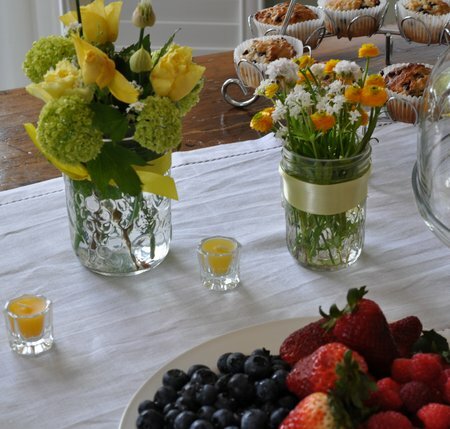 For the table I used a simple white linen runner, and layered on some simple sweet yellow candles with some garden bouquets in mason jars. 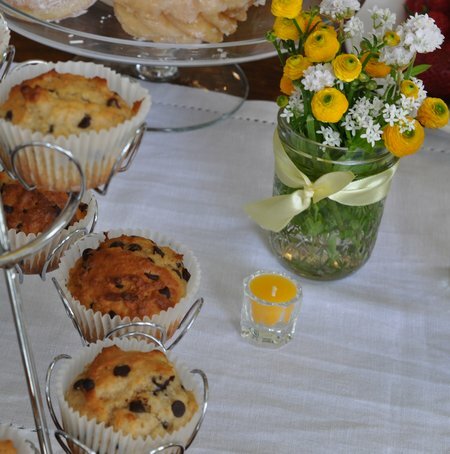 I don’t have many yellow flowers, so I used white, added some yellow spray roses that I bought, and tied the jars with different yellow ribbons. I love how it turned out. I wanted to eat outside in the sun, so we set up the table buffet style. 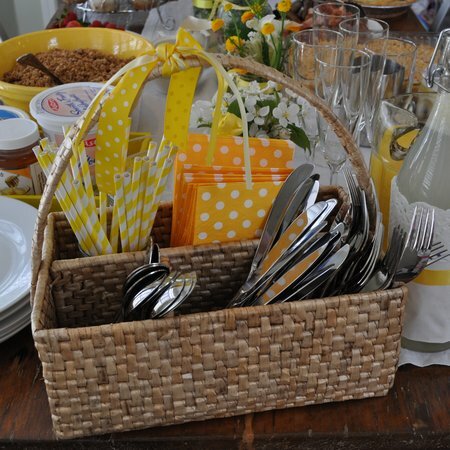 I found pretty polka dot napkins, and these sweet yellow striped paper straws. 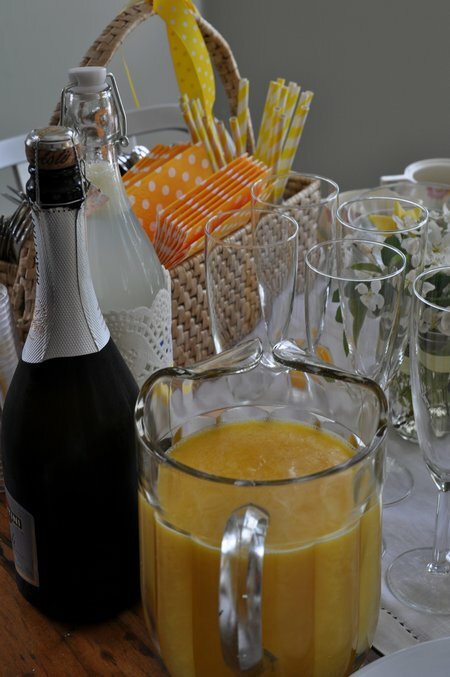 For drinks we served Irish tea, along with lemonade for the little girls, and mimosas for the grown ups. I found this bottle with the fun stopper at the dollar store. 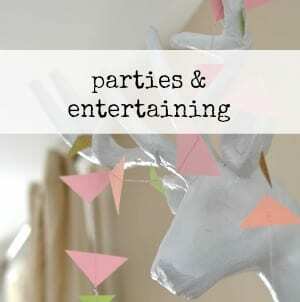 The colour didn’t match our decor, so I wrapped it in a paper doily and ribbon. I love how it turned out. 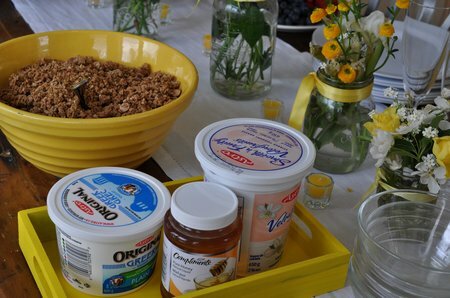 I decided to serve granola with yogurt, honey and berries, so we could make our own parfaits. 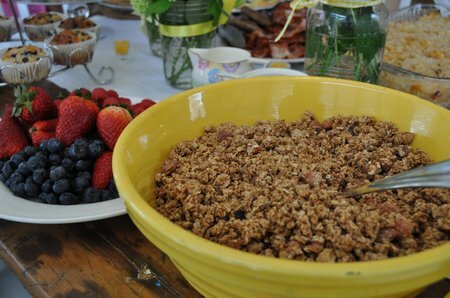 I made homemade granola for the first time, and it was a hit. 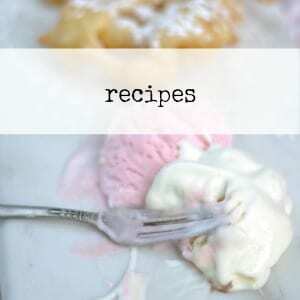 I found the recipe here at “theKitchn“. 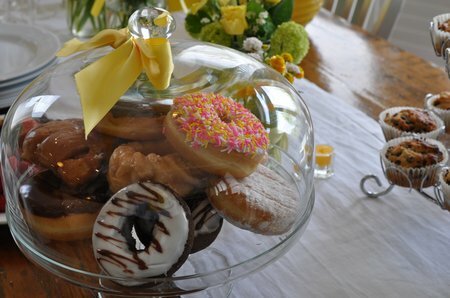 My guests loved it so much that I sent them all home with a little for their breakfast the next day! 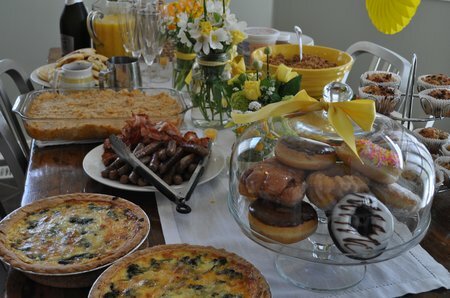 We also served a hash brown casserole, bacon, sausage, and quiche. I used this recipe for the quiche, and made one with broccoli and cheddar and the other with Swiss cheese and spinach. 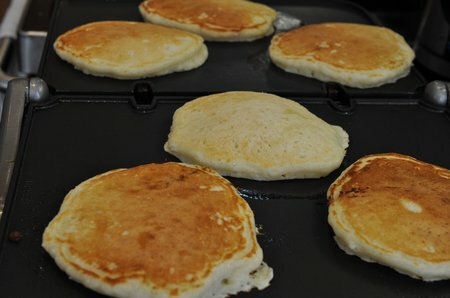 I made them the day before and just re-heated for the brunch. Worked like a charm. The whole brunch idea came about because my husband makes the best buttermilk pancakes. He made plain, blueberry and chocolate chip. We served them with vanilla whipped cream, warm maple syrup, and blueberry syrup, which I made by cooking blueberries in maple syrup. Yum. For dessert we had some donuts, and I made the chocolate chip oatmeal muffins again, see the recipe here -one of my new favs. 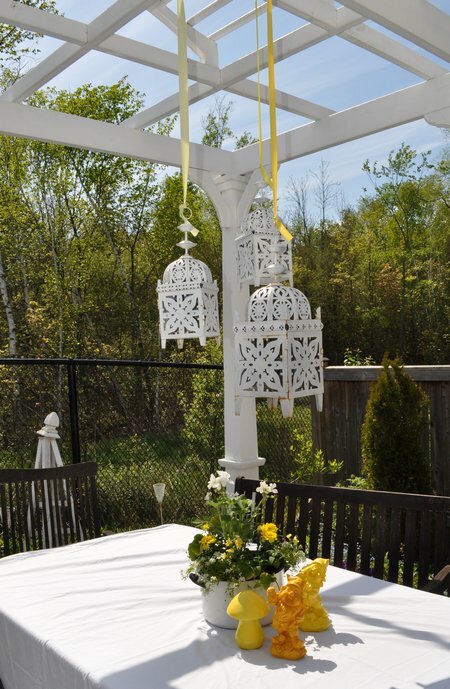 I wanted us all to enjoy the warm weather so I set up the outside table with our yellow theme too. I hung my regular white candle lanterns with some pretty yellow ribbon and I made a yellow and white planter for the table. 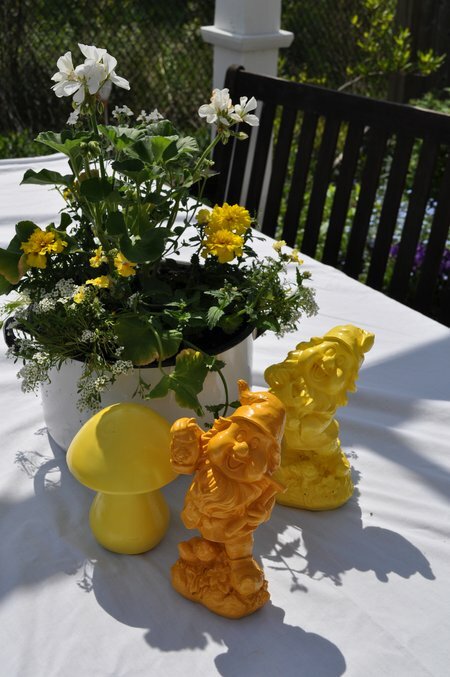 I wanted to add a little more yellow, and thought the garden gnomes were a really fun addition. 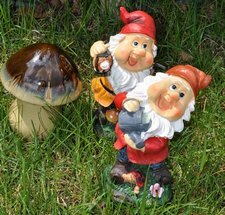 I got some $2 garden gnomes at the dollar store, and a ceramic mushroom and gave them a few coats of glossy yellow paint. 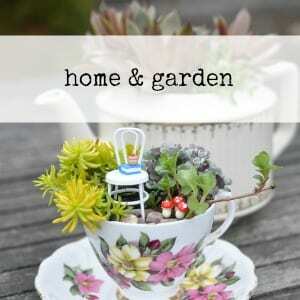 I love the bit of whimsy they add to the table. I will probably re-spray paint them pink later -my favourite colour these days, and add them to the garden border. 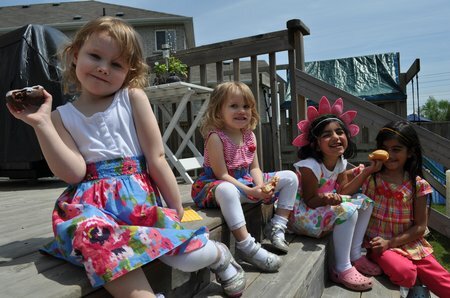 The brunch was so yummy, we all enjoyed the sun, eating and drinking and making our way back to the buffet for seconds and thirds, while the kids played tag and enjoyed the swing and sandbox together. It was a very happy Mother’s Day! 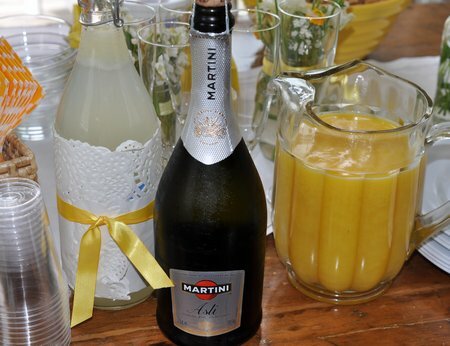 With a brunch like this…life really is a party! This is so beautiful!! I love the white and yellow!! 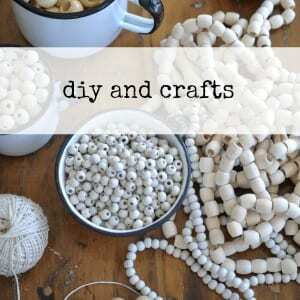 Did you get your light fixture at Ikea? I was just there a few weeks ago for the first time and I seen some light fixtures there that look like yours, I just LOVED them!! All of your food looks delish and I’m sure you had a marvelous time! 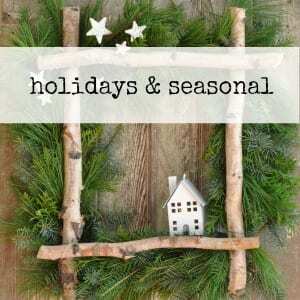 Thank you for sharing and I hope you have a wonderful weekend!! The light is from IKEA, at the time they only had this big one, now there is a smaller one too. Thanks for your encouraging comments.